The Star Forge was a dark side artifact that was created by the Infinite Empire of the Rakata in 30,000 BBY, five thousand years before the rise of the Galactic Republic. A giant automated shipyard, the Star Forge drew energy, heat, and matter from a nearby star which, when combined with the power of the dark side, was capable of creating an endless supply of ships, droids, and other war material. It was constructed through the use of slaves from many subject worlds including, but not necessarily limited to, Corellia, Coruscant, Dantooine, Drall, Duro, Kashyyyk, Korriban, Manaan, Selonia, Sleheyron, Tatooine, and Ziost. It fed on the Force, drawing particularly from the cruel Rakata, corrupting it into an artifact of the dark side, and often times its user as well, which is why Darth Revan limited his contact with the Star Forge, lest it control him as it did the Rakata. In the non-canon dark side ending of KotOR, Darth Revan takes control of the Star Forge. However, Revan later abandoned his galactic conquest and ventured out into the Unknown Regions. Without a strong dark side user to protect it, the Star Forge went dormant and stopped all production or activity, and no other being was able to control its power the way Revan had. 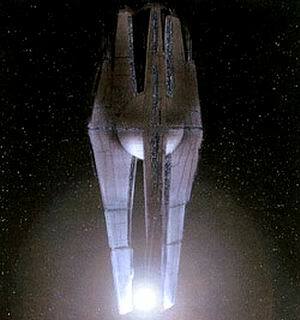 The scale of the Star Forge was extraordinary for its time. Capital ships could easily move between the gaps of the three "fins" that radiated outwards from the central spherical structure. While having few apparent docks for capital ships, many fighter craft and smaller freighters were able to dock at bays located on each of the three "fins". Externally, the Star Forge possessed little defensive weaponry save for several turbolasers near its hangar bays, instead relying entirely on its massive ship production capability as a means to defend itself. Internally, it was capable of manufacturing droids for defense, and possessed heavy blast doors that ran throughout the entire facility. It was also protected by a ship-disabling field projected from Rakata Prime's Temple of the Ancients. The field caused ships to be captured in the planet's gravity well, sending them spiralling to the world below. Construction of the Star Forge. As was the case with all apparent products of Rakatan engineering, the Star Forge managed to survive several tens of thousands of years idling and without an operational crew by relying on its built-in automated repair systems. This trait was replicated in certain artifacts, such as the Star Maps. The Rakatan Builders destroyed them after the completion of the Star Forge, but these slowly repaired themselves with the Star Forge's technology. Whilst the data in each one was incomplete by the time the reformed Revan discovered them, their combined information was enough to reveal the location of the Star Forge. As an artifact of the dark side, the Star Forge corrupted those who used it, feeding its desire for death. Ajunta Pall hinted that it may have been known, and used by, the early Sith, something that can be justified when we think that Revan learned about it among the Sith knowledge in the Trayus Academy. After the Mandalorian Wars, it came into the service of Revan and Malak, who had been powerful and honorable Jedi Knights until discovering the Star Maps leading to the location of the ancient space station, resulting thus to the rebirth of the Sith. Reprogrammed, Revan was ordered to rediscover the location of the Forge, while it was under Malak's control who used it to strengthen the Sith fleet with a massive number of ships. It was destroyed at the end of the Jedi Civil War (3,956 BBY) by a Republic fleet bolstered by the Battle Meditation of Bastila Shan.